Before commencing this academic year, I decided to populate my syllabus with plays I have never read. One of my favorite occupations, reading, has suffered a tremendous blow at the hands of my teaching schedule (as John Fletcher told me would be the case). I figured I would force myself to read new plays and some secondary source material by teaching individual works and historical periods about which I knew either nothing or very little. (I imagine all of this sounds familiar to you as you read this.) Melodrama as a genre was something I knew almost nothing about. Somehow, after four years at New York University and five years at the University of Minnesota, I came into contact with melodrama only twice. The first time was as a TA in Theatre History when we read Black-Eyed Susan by Douglas Jerrold. The second time was during a graduate seminar on historiography when we encountered secondary source material about the infamously successful adaptations of Uncle Tom’s Cabin (here, I’m thinking specifically of Sadiyah Hartman’s Scenes of Subjection: Terror, Slavery, and Self-Making in 19th-c. America). In both cases, the material was presented as a stepping-stone to the larger concern of historiographical methodology. We didn’t dwell on melodrama proper; rather, we framed melodrama within larger issues of, on the one hand, appropriating revolutionary ideas into the nation-building project and, on the other, the connection between archive and repertoire. I decided to confront my foggy memory and dearth of knowledge on the subject of nineteenth-century melodrama this semester, but time constraints forced me to split the difference. I would dedicate a week to melodrama, asking my students to read Black-Eyed Susan and something else, something I had yet to discover. With the plan in place I began to look for titles. After numerous searches I located Rene Charles Guilbert de Pixérécourt (1773-1844), the so-called “father” of French melodrama, a name I had never come across before. Digging deeper, I found that Daniel Gerould and Marvin Carlson had collaborated as editors on a volume of four works by Pixérécourt. Then I did the math: the “father” of French melodrama + two respected scholars in the field = something I need to look into. I got Gerould’s and Carlson’s book and decided immediately to place The Dog of Montargis on my syllabus. A play featuring a dog. Perfect. What historiographical challenge awaits me within the pages of this story about Aubri and his faithful companion? Before I had the opportunity to answer that question, I received my copy of Black-Eyed Susan from Inter-library Loan. The book was actually a bound collection of photocopies of the original text published by Clinton T. De Witt in 1854. Looking closely at the first page, I became greatly disturbed. There I found an advertisement for the catalogue of “De Witt’s Ethiopian and Comic Drama,” featuring such titles as Bobolino, the Black Bandit, Dutchman’s Ghost, Noble Savage, Ethi’n Sketch, and roughly ninety more, all grouped under the subheadings of farce or comedy. Suddenly, the historiographical challenge of the Dog of Montargis seemed less important. Should I present this accidental discovery of De Witt’s catalogue to the students? If so, how should I do it? I delved into our library’s databases and indexes to learn more about the “Ethiopian farce” and De Witt, but I found next to nothing. Time was running out because our week of melodrama was rapidly approaching. To make everything more complicated, I had been receiving pressure from students to lighten the reading load. My current students, as well as numerous comments on my evaluations from last semester, insisted that I made the class too hard and that there was too much reading and writing, especially for a course not classified as writing intensive. Looking over my syllabus, the melodrama week seemed the appropriate time to decrease the amount of reading from two plays to one. Which reading do I eliminate? Black-Eyed Susan? I was already familiar with that play, but this new discovery of De Witt’s catalogue presented a great challenge in terms of linking melodrama to the development of modern racism and discourse on the Other. Do I ditch The Dog of Montargis? It seems like a downright silly play, but I was curious about what lay beneath the silly exterior and I wanted to learn more about the origins (in the Benjaminian sense of the word) of melodrama since I knew nothing about it. Faced with this forking path, I had to choose a direction. Ultimately, I decided to teach The Dog of Montargis, but I would utilize the discovery of De Witt’s catalogue during our exploration of the Black Arts Movement later in Week Twelve. By covering the historical emergence of melodrama via Pixérécourt, I could lay out some fundamental attributes of the genre. Later in the semester, I could return to melodrama as, on the one hand, a pedagogical strategy for re-visiting ideas and, on the other hand, a way of excavating the historical sediment of the stereotyped movements and images seized upon by the Black Arts Movement. In my next two blogs, I’d like to offer a brief tour of both paths opened by my inquiry into melodrama. The first will visit the ideas I discovered upon meeting Pixérécourt, the second will offer my findings on Ethiopian farces that will eventually culminate in a lesson plan for my class on the Black Arts Movement. 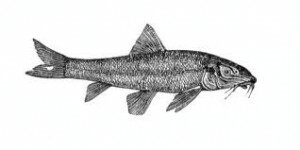 In his article, “Of Fish and Men,” Helmut Müller-Sievers discusses a nineteenth-century biological treatise titled Mémoire sur le système nerveux du barbeau [Memoire on the nervous system of the Barbel fish], published in 1836. The author of that treatise theorizes that, “the entire body of the fish is in fact explicable as a network of correspondences. The nerves correspond to parts of the brain, which in turn correspond to parts of the skull, which again correspond to the vertebrae, which in turn correspond to the nerves, which are themselves analogically related” (713). This notion of the fish as a network of correspondences stemmed from the natural philosophical theories prevalent in Germany during the early nineteenth century. In fact, much of the theory developed in the Mémoire derived from Goethe’s natural-philosophical concept of the Urbild and the Urtyp. For Goethe and others of his (pre-Darwinian) time, “evolution was not yet disrupted by the irreversible catastrophes of selection.” As such, they believed that, “every natural form either harbors the germ of its further development or else harks back to more primitive manifestations of itself” (713). To study the nervous system of the Barbel fish, then, was to penetrate the mysteries of becoming, that is the unfolding of life in the natural world. Goethe’s concept of Urbild developed from the belief in the existence of a “simple basic pattern, repeating itself over and over again in the natural world” (Price xii). Urtyp, which basically meant “blueprint,” was something that inhered in all natural forms. Naturalists of Goethe’s time believed that the trained eye could perceive this Urtyp within natural forms and that, once observed and then studied, the knowledge first discerned by the eye could transform into knowledge of the simple basic pattern that exists in all living things. The author of the Mémoire, as with Goethe before him, believed that this notion—that a simple form evolved within all living things and that one could learn to perceive this evolution with the eye—led to philosophical revelations. As opposed to the spatial diagnosis of most anatomists—diagnoses that relied on the symmetry of the brain’s two hemispheres, for example, or the symmetry of nerves within the Barbel fish—this notion of Urbild proposed a temporal method of analysis keyed to the metamorphoses of living creatures over time. As such, these theorists challenged Kant’s notion that the human intellect could not perceive time. Time was visible in the becoming of natural life. One need only learn to perceive this unfolding as it unfolded. Müller-Sievers traces the theories of Goethe and the author of the Mémoire and eventually makes this assertion: “The cold eye of the observer froze and isolated natural forms which were in reality fluid and interconnected. Each form referred to another of which it was, in a general manner, either the germ or the fruit. This network of correspondences found its outer limit in a highly dynamized, and often personalized, concept of nature whose horror was not simply that of the void but of arrest and stillness.” (709). In other words, by ascertaining the process through which all life evolves and changes over time, one actually comes into contact with death, the arrest and stillness of nature that horrifies (and in a certain way titillates) the human observer. The author of the Mémoire sur le système nerveux du barbeau was none other than Georg Büchner, the author of Danton’s Death, Woyzeck, and other plays (Leonce and Lena), novels (Lenz), and even a political treatise (The Hessian Courier). Victor Price tells us that, “Büchner sent his treatise on the barbel to Lorenz Oken, the natural philosopher, who was professor at the newly founded University of Zürich. Oken found it so impressive that he recommended Büchner for a doctorate without oral examination, and he was offered a post as Privatdozent in the University” (xii). He also tells us that Danton’s Death and this treatise on the barbel fish were the only works by Büchner to be published during his lifetime. In fact: “When Georg Büchner died at twenty-three, his contemporaries, who knew only a garbled version of Danton’s Death, mourned him as one who could have become a great scientist” (vii). I thought it was interesting, and the facial expressions on students in the class seemed to suggest at least a mild interest in the parallel between Büchner-the-scientist and Büchner-the-playwright, whose Woyzeck some of them were familiar with after our Department’s recent production. More interesting, however, were the lines of inquiry that emerged after the class. One of my students asked for more information about Büchner’s fiancée, Minna Jaegle. I had mentioned her name only in passing, but the brief mention was enough to set the wheels turning. Another student felt lost after the lecture and decided to do some historical research on the real-life Danton and Robespierre. Our in-class conversation covered the rise of Sturm und Drang, the emergence of the German state theatres, and the appearance of the Young Germans, but I had not discussed the French Revolution in any depth, so this student took matters into her own hands. Eventually, she emailed me to say that her research made the play much clearer. This student even suggested that in the future I provide information about the historical figures that make appearances in Büchner’s play. I thanked her for the suggestions and told her that I would take that into consideration, but that I much prefer for her to complement our in-class discussions with her own research. From fish to Büchner to Minna Jaegle to the historical Danton and Robsepierre: this was week three in Theatre History. I’m curious to know how other people handle Büchner when they teach this time period, or if people handle him at all. Price suggests that he never saw one word of his uttered upon a stage and that there is no evidence to suggest that he ever went to the theatre. Lines from Danton’s Death, particularly Camille’s rant against puppet shows in act two, scene three, seem to suggest he had. Still, it wouldn’t surprise me if teachers skip over him altogether because of the overly-literary quality of his plays. Please share your thoughts on Büchner. I’d love to hear them. * I have read that Büchner was openly hostile to Hegel’s system of the dialectic. To me, however, it seems that perhaps Büchner had internalized the dialectical logic and rebelled against Hegel’s insistence on the eventual resolution between opposites. It might be worthwhile to study Büchner as a forerunner to the theory of negative dialectics. ** Though the French Revolution of 1789 was the focus on Danton’s Death, it is probable that the failed July Revolution of 1830 in France and the semi-uprising in Poland against Russian authorities were present in his mind. Müller-Sievers, Helmut. “Of Fish and Men: The Importance of Georg Büchner’s Anatomical Writings.” MLN vol 118 no. 3 (April 2003): 704-718. Price, Victor. “Introduction.” Georg Büchner, Danton’s Death, Leonce and Lena, and Woyzeck. Oxford, England: Oxford University Press, 2008. Walter Benjamin has helped me think about teaching theatre history. “The term origin,” he writes in The Origin of German Tragic Drama, “is not intended to describe the process by which the existent came into being, but rather to describe that which emerges from the process of becoming and disappearance” (45). His poetic formulation of this idea supports my assertions in the classroom that nothing is created in a vacuum, but it also presents a methodological challenge to me as I design my syllabus for this Part II of a year-long theatre history survey course. How can I tinker with the chronological timeline of the class in order not to banish it, not to castigate it to the realm of “those other” theatre history classes, but to make time and space visible as operative modes of theatrical endeavors unfolding in history and as history? Even more challenging: can I create a syllabus that harnesses this (rather mind-blowing) image of origin as “an eddy in the stream of becoming”? Can my syllabus swirl in on itself and produce an eddy in our thinking about theatre history from the Enlightenment to Postmodernism? Then, after swirling inward, can our conversations in theatre history class reach beyond the stated scope of the syllabus and send us spiraling outward and help us re-think our performances of everyday life? The course starts with Pierre-Augustin Caron de Beaumarchais’s The Marriage of Figaro (pre-Revolutionary France). From there we trek to the Black Forest and paddle down the Rhine to Germany where we encounter Johann Wolfgang von Goethe’s Faust, Part 1. Since Goethe wrote this work over sixty years (! ), the (Kantian) smooth flow of time convulses and stammers, forcing us in the classroom to assess Goethe’s dramatic work not as a snapshot of a specific time and place but, rather, as a palimpsest of multiple time periods and artistic-philosophical movements (Sturm und Drang, Romanticism, Weimar Classicism). After Goethe, we linger in Germany but reflect back on France through the lens of Georg Büchner’s Danton’s Death. The barbel fish expert turned playwright [More on this in future blog posts ] conjures France’s Revolutionary past as a way to cope with the restoration of the French monarchy, the failed Polish revolution of 1830, and, by extension, the windfall for conservative governmental forces in his native land. This syllabus stutter step between Germany and France acquiesces to the French and we return to France via René Charles Guilbert de Pixérécourt’s The Dog of Montargis and the birth of melodrama, that odd combination of popular spectacle and Romantic striving for the Good. This journey does not present a chronological assessment. Instead, we are, all sixty-nine of us, making a swirling, spiraling eddy in the ocean of theatre history. The spiral derives its momentum from the French Revolution, takes a tour out to the far reaches of Romantic and post-Romantic drama with Goethe and then Büchner, and then deposits us back in France at the end of Napoleon’s rule. Why make this journey? Instead of a linear march through time, I ask the students to think about these four weeks as a case study in Revolutionary Theatre. During our four-week tour, we can look at the French Revolution from many angles. We can see its bacchanalian splendor and then feel the morning-after awkwardness when everyone looked each other in the eyes and asked, “Did we really do that?” We can see its radical side, its conservative side, its sublime embodiment of the triumph over despotism, and its goriness. I’ve decided to focus our attention on the relationship between France and Germany because it is this relationship that leads eventually to the First World War, an event that utterly changes the way humans interact with each other in Europe. The centripetal force gathered from this initial swirling movement ultimately propels us through the post-WWI assault on dramatic form (by Expressionists, Dada, and the like) into a string of critiques of European ideologies that populate the second half of our semester’s study. I’d like to create a rip tide that pulls the students into the collective challenge of the class. That challenge is not to memorize names, dates, events, or genres, but, rather, to re-think the now in which we have gathered. How can thinking historiographically about theatre at the turn of the nineteenth-century help students to reflect on the stories they tell themselves about their mission as students, their wishes as theatre artists, and their desires as young adults living at the turn of the twenty-first century? Can Benjamin’s “eddy” lead to meta-awareness and self-reflexivity so that we become attentive to how we do theatre history and not just what we study? Of course, only time will tell. As for the other goal I’ve set for the semester, to encourage students to think through theatre history to their individual lives in the present moment, I’m drawn back not to Walter Benjamin but to the author David Foster Wallace. The connection between these two thinkers is not as tenuous as it may appear at first, at least not in this case. In his address to a graduating class of students at Kenyon College, the author of Infinite Jest, and a number of other novels and collections of fiction and nonfiction, presented a talk called “This is Water.” Benjamin’s metaphor (is it a metaphor?) relies on the idea that our becoming unfolds as a stream, which, by extension, requires that we must be wet. Wallace starts out his commencement talk with this familiar joke: “There are these two young fish swimming along and they happen to meet an older fish swimming the other way, who nods at them and says ‘Morning, boys. How’s the water?’ And the two young fish swim on for a bit, and then eventually one of them looks over at the other and goes ‘What the hell is water?’” [http://moreintelligentlife.com/story/david-foster-wallace-in-his-own-words]. Though Wallace was not most likely imagining Benjamin when he planned his speech, his set-up joke and subsequent talk offers a pedagogical insight that forms a resonant analogue to the ideas I’ve been discussing so far. DFW assures his listeners that he is not the “wise old fish” attempting to install some truth about life in the minds of all present. “The point of the fish story,” he suggests, “is merely that the most obvious, important realities are often the ones that are hardest to see and talk about. Stated as an English sentence, of course, this is just a banal platitude, but the fact is that in the day to day trenches of adult existence, banal platitudes can have a life or death importance, or so I wish to suggest to you on this dry and lovely morning.” The platitude he chooses to focus on is that liberal arts education is about “teaching you how to think.” He goes on to advocate for a re-evaluation of the “capacity to think,” which he identifies as that which leads us all to be a little less arrogant. Why less arrogant? Because we hardly ever remember that this is water, and that it will take our entire critical capacity to develop an awareness of the most obvious truths about our situation. To transpose this sentiment to the Benjaminian-historiographical key, we might say that we hardly ever remember how specific historical conditions shape every contour of our present, our now (jetzeit), or that our specific way of doing theatre comes from a certain trajectory that has been actively selected and presented as the curriculum. Wallace’s hyper-self-reflexive, postmodern narrative and Benjamin’s post-Enlightenment inspired historical materialism converge in their attunement to the conditions that make our present possible. The trick for me is to remember that I am also a student. I chose the epigram about arrogance from Wallace because it reminds me that I have to foster a critical awareness about myself and my certainties as I teach this course. This means being willing to change, to call audibles from the line as I see the momentum of the class change in front of me. In the next several blog posts, I’d like to report back on the changes I encounter throughout the semester and I welcome any and all comments. A palpable absurdity permeates my being whenever I prepare to teach a theatre history survey course. This absurd feeling, something I would describe as an out-of-tuneness with the actuality of the task facing me, reverberates wildly through my bones. What, frankly, are we to do, we who teach these courses? As Steve Tillis has argued in his essay, “Remapping Theatre History,” we teachers of theatre history in the United States find ourselves heirs to a centuries-old Eurocentrism that forecasts a dreary classroom experience. More than Eurocentric, Tillis argues, we frequently succumb to a bland parochialism, “‘parochial,’ that is, in the sense defined by the Oxford English Dictionary as ‘relating or confined to a narrow area or region, as if within the borders of one’s own parish; limited or provincial in outlook or scope’” (Tillis 1). That is, despite the multitude of perspectives that have opened onto South American, Middle Eastern, African, and Asian, and Australasian theatre histories in the recent years, theatre history survey classes in higher education continue to abscond back within the well-protected walls of European theatre history. Of course, the solution to this parochialism cannot simply rest in an adoption of non-European material at the expense of the Ancient Greeks, Ancient Romans, Medieval monasteries, Cid controversies, and Elizabethan playhouses, can it? I mean, we’re supposed to figure out a savvy self-reflexive method of pairing the parochial with the global to present a thorough historiographic deconstruction of all that we know, aren’t we? This is the point at which that out-of-tune feeling begins to resonate in my toes. I have three weeks to put together my syllabus. I don’t want to quarantine my students within the tiny parish of traditional theatre history studies. What do I do? My decision: to fail tactically. To face this absurd challenge in front of me, I have chosen not to construct a radically global theatre history syllabus that can address Tillis’s concerns and blaze new trails through the halls of the university, but, rather, one that allows me to perform the limitations of the traditional theatre history survey timeline along with, and for the benefit of, my students. This tactical failure takes a cue from Beckett’s motto in Worstward Ho, “Try again. Fail again. Fail better.” This failure does not take success as its opposite; rather, tactical failure describes the practice of mapping the limit of thought, setting sail towards that limit, and embracing the perplexity that comes from reaching it. In the spirit of this mission, I present this Theatre History Irrationale to accompany my syllabus posted on this theater historiography site. To fail tactically with my students, and, through doing so, to embrace the problem of theatre historiography: this is the goal that undergirds my syllabus. To achieve this goal, I embrace not only the Western theatre history tradition but also the futility of attempting to cover that canon of works in any depth in the span of fifteen weeks. Each of my lectures and class discussion frequently fall in on themselves and expose what Matthew Goulish calls the “irreducible complexity” of, in this case, historical inquiry. I want to encourage my students to engage in that complexity instead of bypassing it for easy answers. To do this, we need to learn how to ask questions. We, my students and I, need to learn how to see what has been rendered invisible by historical narrative. We need to sift through the historical ground from which specific plays emerge in order to grapple with the modes of thinking that allow such plays to exist. One such example of this philosophy in action is my unit on Classical Roman Theatre. I have assigned two class periods, a total of four hours, for our exploration of this material. This year, I paired a chapter from Donald G. Kyle’s Spectacles of Death in Ancient Rome with Seneca’s Oedipus. The students read these two texts and I supplied some additional contextualization through excerpts from History of the Theatre on the phenomenon of the “closet drama,” passages from Horace’s Ars Poetica, and some tidbits on Seneca’s relationship with Nero. Once we had orientated ourselves within the matrix of these materials, a problem emerged: to which historical line of sight does Seneca’s play belong? Should we read it as a closet drama that abides by the rules of decorum set out by Horace, or should we treat it as a spectacle of death akin to the munera of Seneca’s day? For the majority of class, the students developed arguments to support one of these perspectives. I asked them to pay special attention to the stakes of their argument. So What? What does it matter if Iocasta’s death was merely described in words on a page or if an actress actually disemboweled herself in front of an audience? Why should we care about this question at all? Despite the multiple and well-argued answers to these questions, our conversation was cut short by time. We reached no solutions. I announced that we were leaving Rome and jumping ahead nearly ten centuries next week. The students groaned, a sound I interpreted as a desire to keep digging through Seneca. Death, its particular significance in the spectacles of Ancient Rome, its relation to Seneca’s play, and its ambiguous treatment in Horace became floating themes that will continue to haunt our future classroom discussions. My lesson plans did not bring any answers to the students, just as I had willfully acknowledged prior to starting the exercises. Instead, what we did experience was how to wrestle with a diverse set of historical materials and events, and we gained an understanding that the need to wrestle outweighs the need for certainty. Of course, this failure is neither good nor bad. It is, at best, a delay. Tactical failure-as-delay helps to provoke inquisitiveness and teaches the art of producing arguments instead of the acquisition of knowledge. This type of failure applies to my own process of learning as well. This fact became vividly clear while trying to unpack the ambiguity of Aeschylus’s play The Persians. Is the play a victory lap for the Athenians after a harrowing war with Xerxes’ forces, or is it a complicated display of empathy through which the other becomes more knowable? For two of my students, both of whom claim Persian descent, neither question mattered. Both students were so furious with the depiction of the Persians that they didn’t even listen to the in-class conversation. For my TA, the mere presentation of this play created trouble because, she felt, it was likely that the students would have no other representation of Ancient Persia to supplement this Greek-centric portrayal. After receiving this feedback, I decided to bring the conversation around the upset into the classroom and to explain that I had failed as a teacher. In fact, I suggested, teaching is a never-ending string of failures through which the wealth of the unsaid becomes visible. I admitted that, having taught The Persians for the first time, I would like to pair Aeschylus’s play with a Persian theatrical piece in the future. At the present, however, I am unfamiliar with that aspect of theatre history and I need to mark that fact for everybody. In the future, I’ll try again, fail again, and fail better. I call this supplemental document an “irrationale” partially because it does not adequately defend the choices I made while creating my Theatre History syllabus. I make no effort to defend those choices because I feel they need no defense. Instead, I intend this irrationale to highlight the tactical use of limitations and failures in my pedagogical strategy. While my syllabus may appear no different than the material Tillis (rightfully) scrutinizes and queries in his essay, I want to express the thought that what we teach is only half the story. How we teach the material we choose to share with students seems to be the more fruitful avenue of inquiry. Within that how exists a practice of teaching. By allowing that practice to embrace failure and the limitations of the canon as teaching materials I try to help students learn the art of questioning and I work on developing a reciprocal method of learning through which I teach the students and students teach me. In fact, there is a third party: the historical material itself. This third party acts as a spectral beacon that helps us to triangulate our ontological and epistemological position in the present, though the perpetual appearance and disappearance of the historical signal means that, ultimately, the students and I are left wading through the deep ocean of the past together. 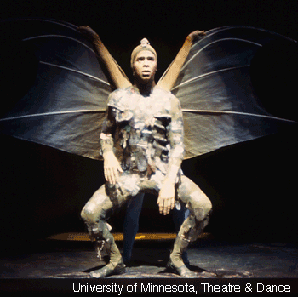 Will Daddario is teaching the theatre history sequence at University of Minnesota—Twin Cities Campus in 2011-2012. You can find his syllabus in the Faculty Club area.